Four words: Outdoor. Heated. Infinity. Pool. It’s massive. 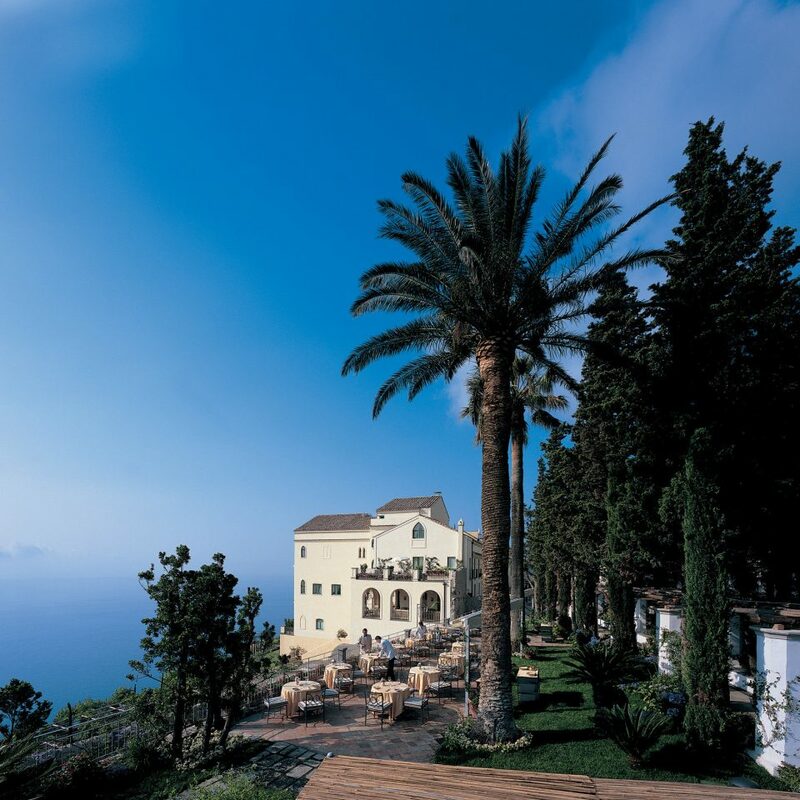 It overlooks the Tyrrhenian Sea and the Amalfi Coast. The staff will bring you an Evian vaporizer and fresh fruit while you’re in it, and remember you by name. You can have a private candlelit dinner floating on it, with a customized menu and live music. After that, does it really matter what the rest of the hotel is like? The rest is impressive, anyway. 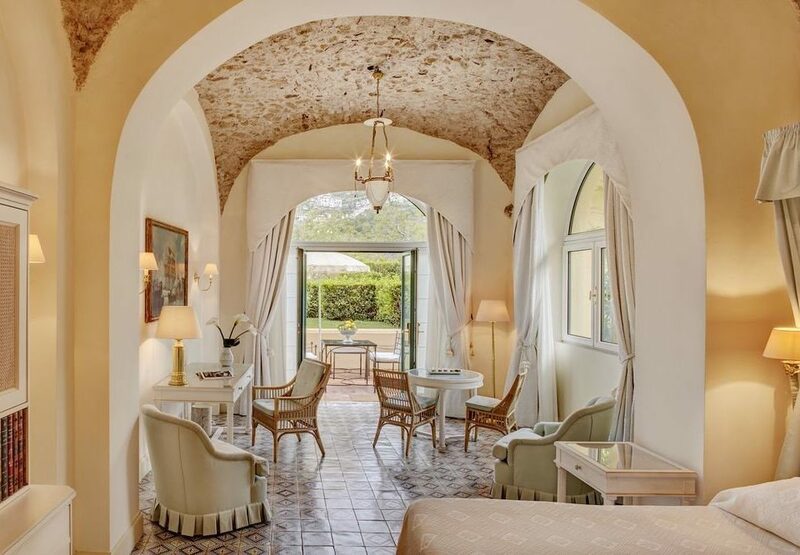 The recently refreshed property boasts glorious gardens; spacious guest rooms with mosaic floors and private outdoor spaces, Frette fabrics, and Bose sound systems; and the Belvedere restaurant serves locally fished red sea bream and Italian wines. 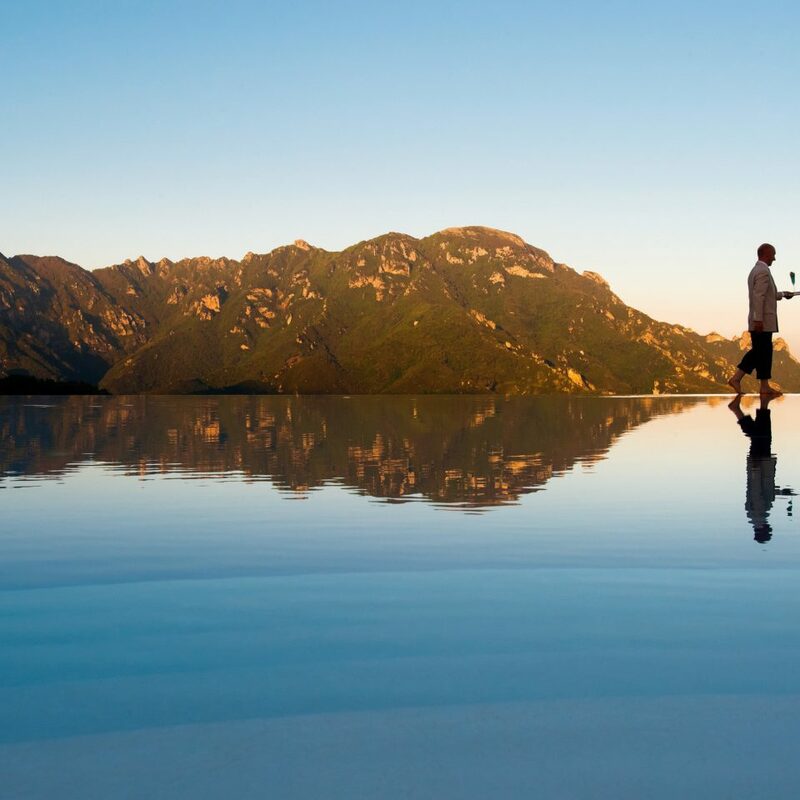 It’s a destination hotel for sure, with its superb perch above the coast, but its spot in the village of Ravello and handy access to the water makes sightseeing easy. Or you could just stay in the pool until it’s time to check out. No judgment from us. 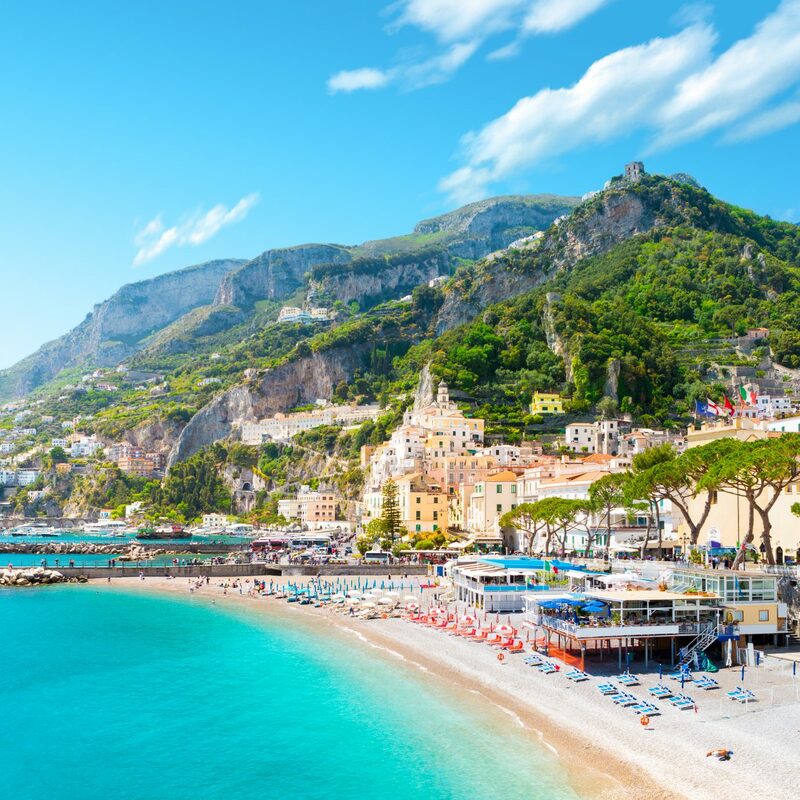 Sightseeing in Ravello is easily done on foot; attractions like the 13th-century Villa Rufulo, a stunning historic building with equally impressive gardens, and the lovely Duomo are just minutes from the hotel in the elegant Piazza. Stop in afterwards at Babel, a snug café-bar that also functions as an art gallery, for a glass of local wine or an Italian craft beer. More modern architecture can be found in the Oscar Niemeyer-designed New Energy Auditorium, whose eye-catching structure is meant to imitate the swell of the ocean. The hotel runs shuttles down to the coast if you want to dip a toe into the sea you’ve been viewing from the hotel. 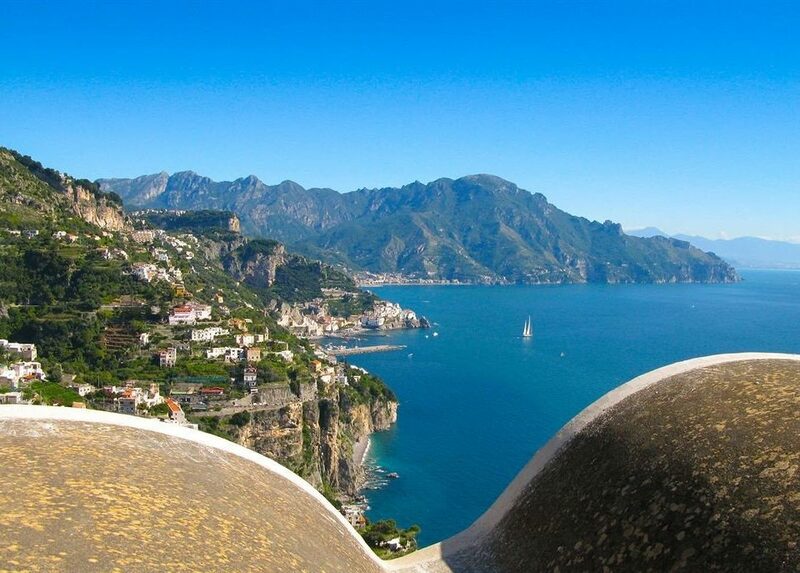 If you’re in town during the summer, don’t miss the celebrated Ravello Festival of music, dance, and film. 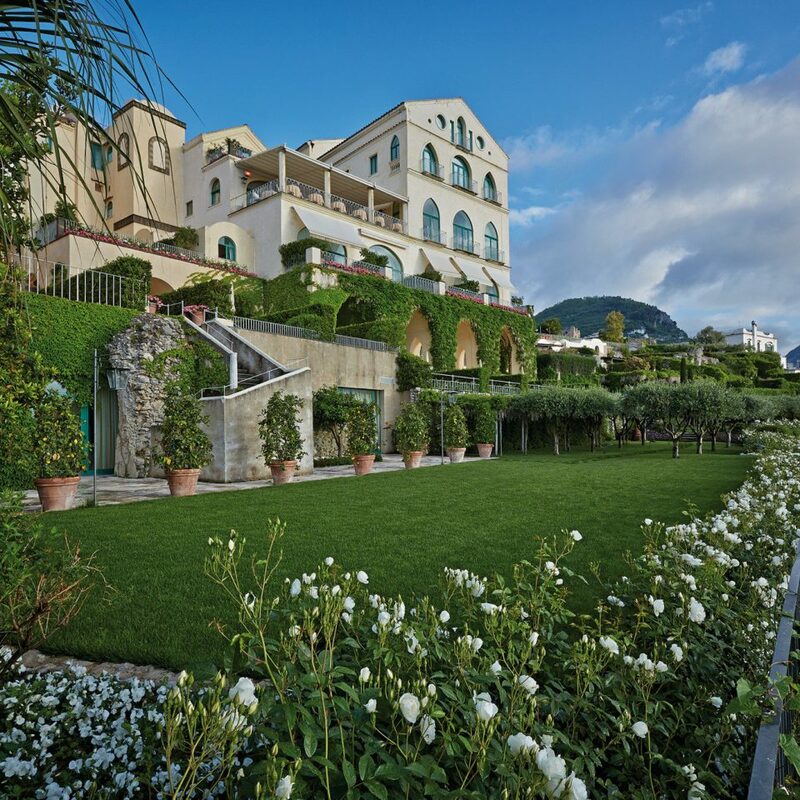 We spent two nights at the Belmond Caruso as part of a trip where we visited Rome and Capri. 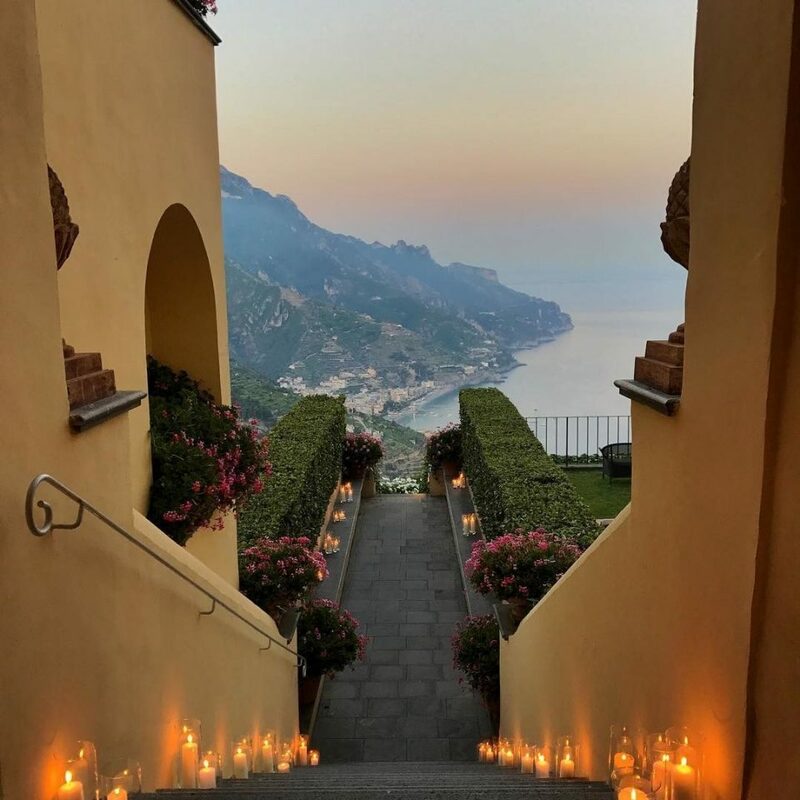 While the setting and scenery was arguably the most beautiful in Ravello, we would rate the hotel as the worst one we stayed at during the trip. We got off to a horrible start when the hotel called me while I was in Rome to ask me to confirm how many rooms I had. Only the one I responded...apparently they had booked us twice, despite me confirming months in advance that we had only one room. After some serious arguing, they finally agreed to do me the favor of only charging me for one room. Wow, how generous, you didn't make me pay for the 2nd room I never booked on your stupid out-dated system. In any case, the room was lovely, if a bit dated, and the terrace had a lovely view, although it's not very private as you're right next to another room's terrace and then there will be two more above you ( we were in the superior junior suite with a view). Nonetheless, no big deal. Another pretty big issue is that the room was most definitely infested with bugs. I was bit all over, and this was the only hotel where we had the issue in the whole stay, despite the hotel insisting they didn't have bugs, nor that it was their fault. Strike 2. The pool is as advertised. Absolutely stunning. Definitely get there right when it opens if you want any chance at one of the better spots. However, there is no semblance of culture or dignity. Kids are allowed to roam and splash and scream like it's disneyland, not a high end 5* hotel. Rude russians will be babbling on their phone right next to you for hours on end (why are phone calls allowed in such a serene setting? go back to your room if you must). There is just no culture, no class, no manager clearly keeping this place in line. 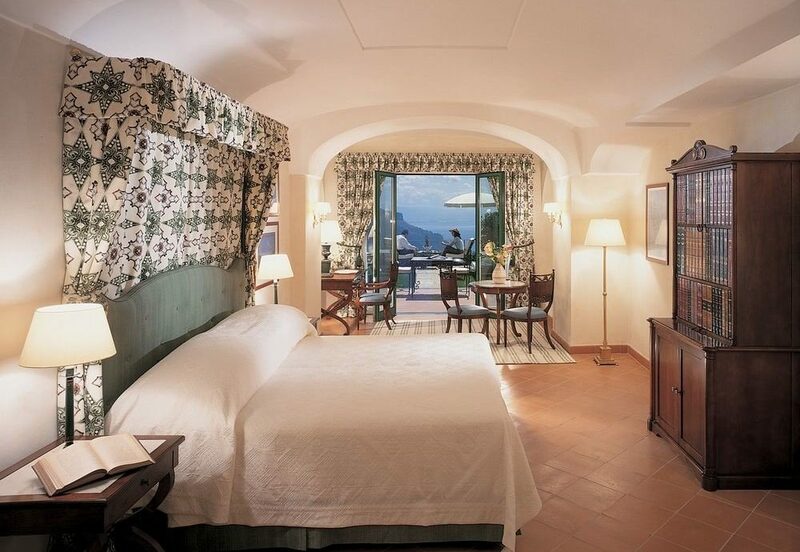 If you've stayed at the JK place in capri, you will understand what I mean by this last bit. Or if you've stayed at an Aman anywhere globally. So if you're used to that level of service, relaxation, and culture, you will be sorely dissapointed. 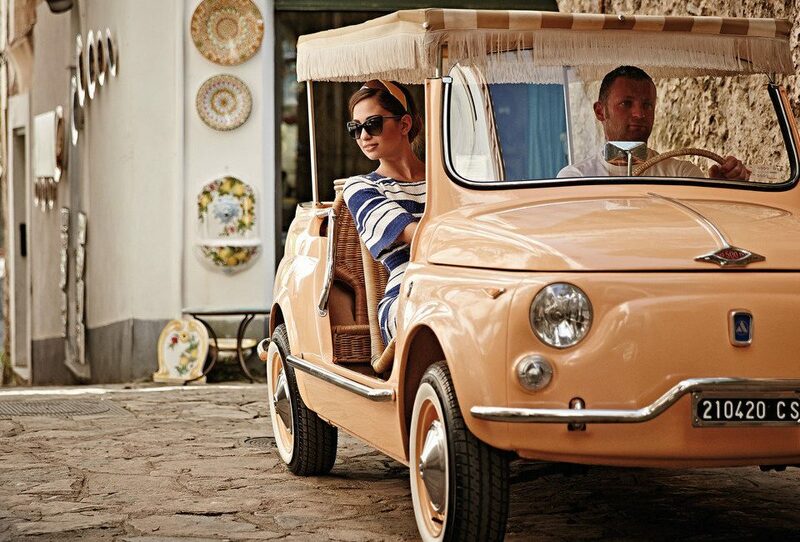 If you're looking for a high class disney world meets amalfi, then maybe this place will be okay. Restaurant was typical of italy, which is to say very good, but food outside the hotel is probably better. Still can't believe I stayed here! Multiple staff members step up to greet you and memorize your name upon arrival. From this moment on, you will not be a nameless "sir" but "Mr ____" If you call up the front desk, they're going to answer "Hello Mr_____, how may I help you?" 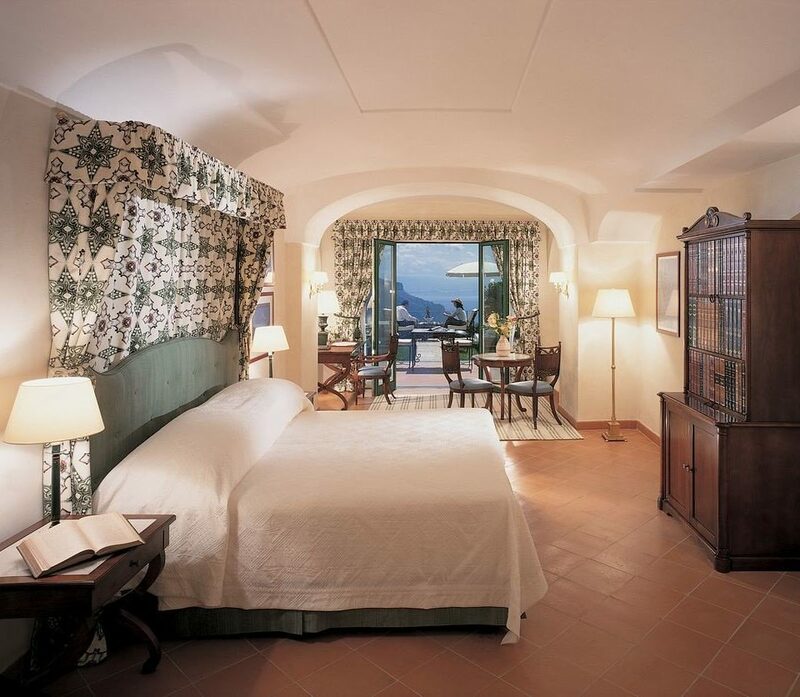 We were shown our stunning room in this converted 11th Century palace which had a private terrace opening up to the Mediterranean Sea from its perch atop the Ravello hilltop. The infinity pool is unreal, looking out to the sea and mountains on the other side of the inlet. The outdoor gym with its bikes and ellipticals overlook the same mountains and sea. 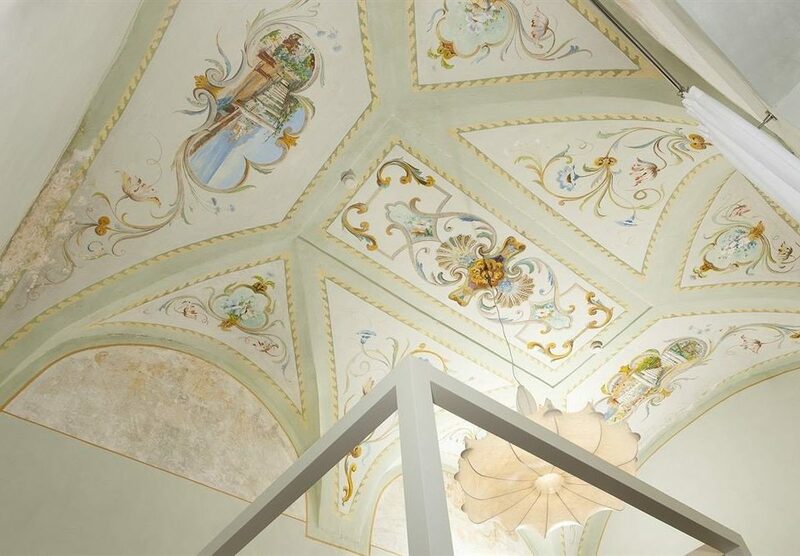 Every outdoor and indoor space is meticulously designed with the utmost taste and restraint (compare to the loud Versace-chic style of next door's Palazzo Avino which we went to for dinner one night). The attention in their service still makes my head swoon. Waiitng for me on the desk in my room as a handwritten note welcoming me and a bucket of ice with champagne and fruits...oh did I mention that everything was SILVER? bucket, forks, knives, spoons...tissue box (!!) in the bathroom. I almost fainted when I realized this on the 3rd day and I saw the same tissue box in the public bathrooms but these were in stainless steel. We heard a piano concert in town one night and because we came home so late we missed dinner. No worries, we ordered room service at no significant mark up. Oh and breakfast? Don't feel like eating with the common folk out in the gorgeous dining rooms? No problem, they will haul the heaping plates of breakfast food into your room or terrace at no extra charge. Just leave your choices on the order card and hang it on your doorknob by 4am!. We did that one morning just to try it out for the hell of it and I was so embarrassed of the wasted food I wanted to tell them to take some of it back! 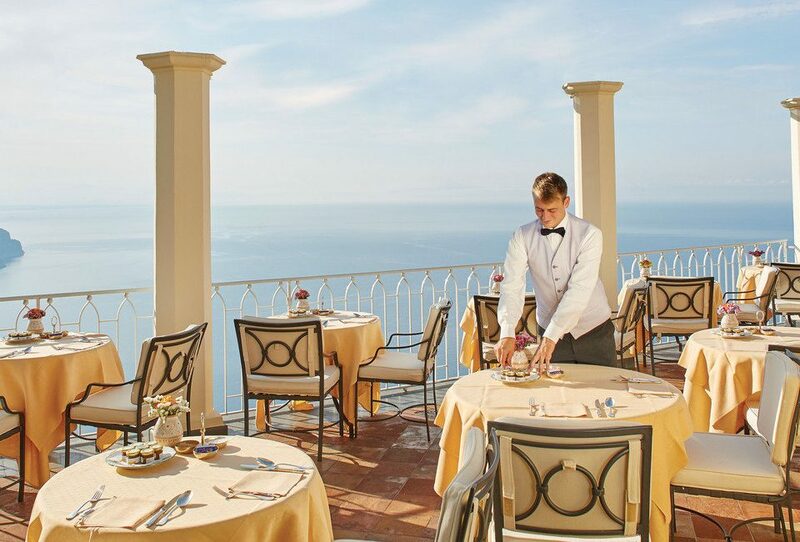 (they bring every single kind of roll and pastry available in the dining room to your terrace). Their commitment to service was carried out to such an obscene level even to the last moment when we left for our flight in Naples -- We called for the car about 2 hours in advance of our flight check in thinking that that would be enough time. We could tell they were quite flustered as they scrambled to find a car for us at such a short notice (we didnt know that that was absurdly late to be getting a car to the airport, we should have made arrangements the night before or hours before). But it was fascinating how they kept their calm and insisted on adhering to service with a smile. As someone familiar with the service industry, I would have said something snide to the customer if our positions were reversed but not once did they shame us for such a stupid rookie move and instead absorbed the brunt of our mistake by quickly finding a car for us at the last minute. I had realized our mistake at this point and I was so relieved and grateful they found a car for us so I quickly thanked them when they said it had arrived and sped out the door. "Hold on," they warned me with their heads hung low, "...it's not an E class". Oh god bless them for worrying about the class of the Mercedes they found for us when all we cared about was getting to the airport on time! (ha ha ha ha). Thanks to all at the Belmond. I am quite sure I will never have this level of service ever again in my life! I should've written something sooner but I didn't want to share this gem! This is truly one of the most amazing hotels I've ever stayed at. 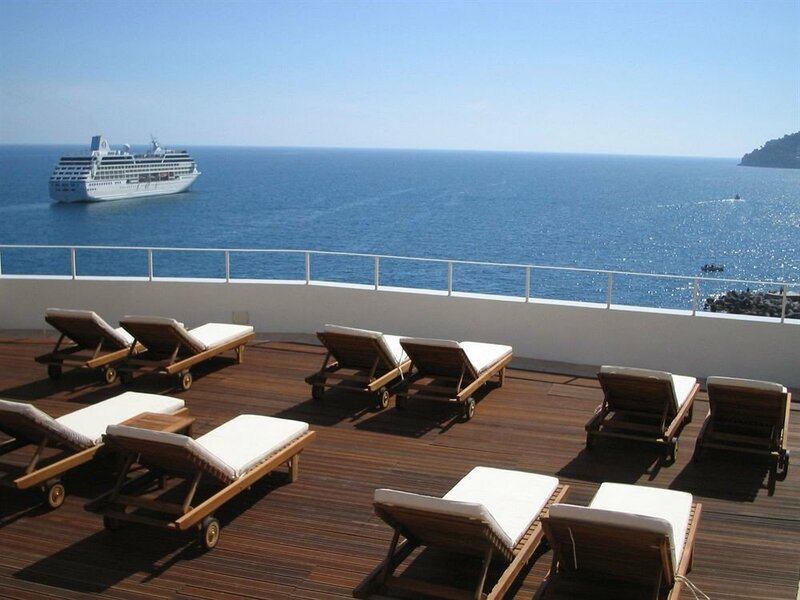 We had the most perfect view of the Mediterranean from our Deluxe Junior Suite. There was a wedding the afternoon we arrived and we had the patio windows open, there was a soft saxophone playing and I took the best nap of my life. Location, service and everything was absolutely perfect. Can't wait to come back! Another note, we threw something away in the trash that could look valuable and housekeeping noticed and put it back for us. Talk about impeccable service! The staff were professional, hardworking, helpful, knowledgeable and kind. We felt well cared for. 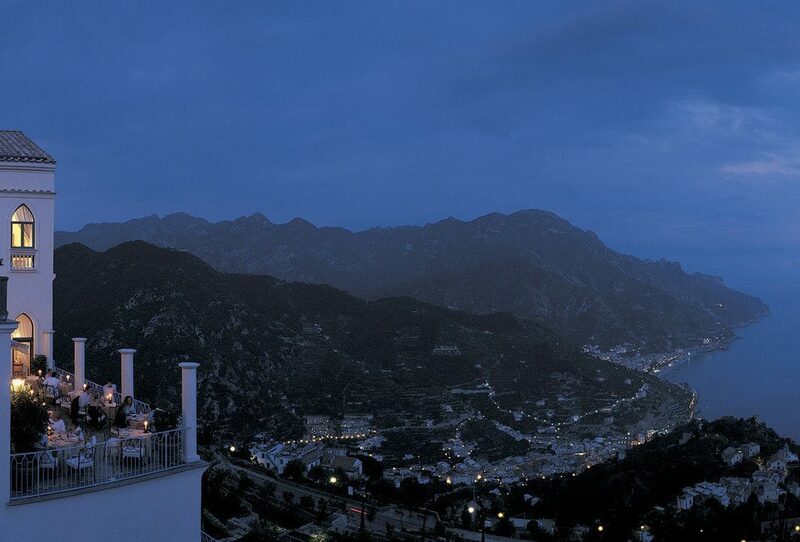 The views over the terraced gardens and Amalfi coast are exquisite and dramatic. The infinity pool is so pretty with the mountain Nd ocean backdrop. The breakfast buffet is healthy and fresh and offers a large selection. This hotel is heaven on earth! I think this hotel deserves 6 stars. Hands down it excels in every aspect. Our room was incredibly gorgeous and had a huge patio with breathtaking views of the coast and lemon trees. The bathroom is luxurious with all the toiletries one could need. 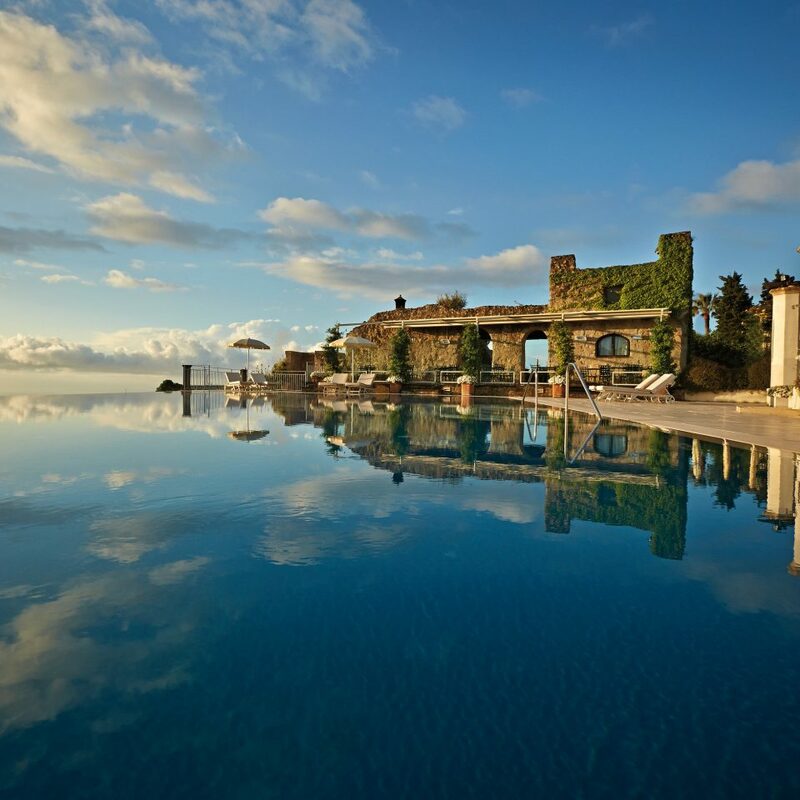 The infinity pool is stunning. We spent a day relaxing there. The dinner at the restaurant was good but not spectacular. Breakfast was super. Top notch service and quality. 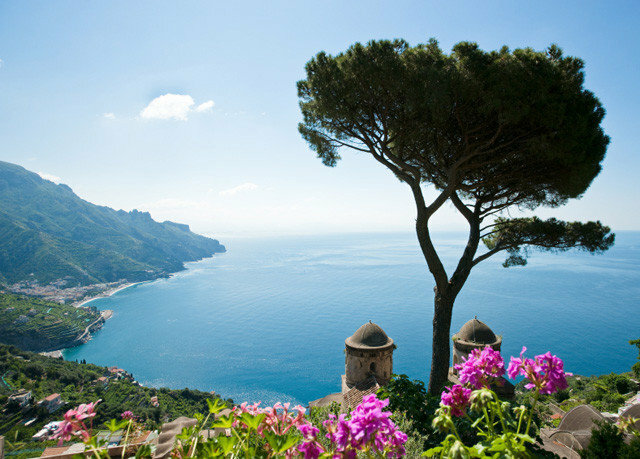 Ravello is a charming little town situated on top of a mountain. 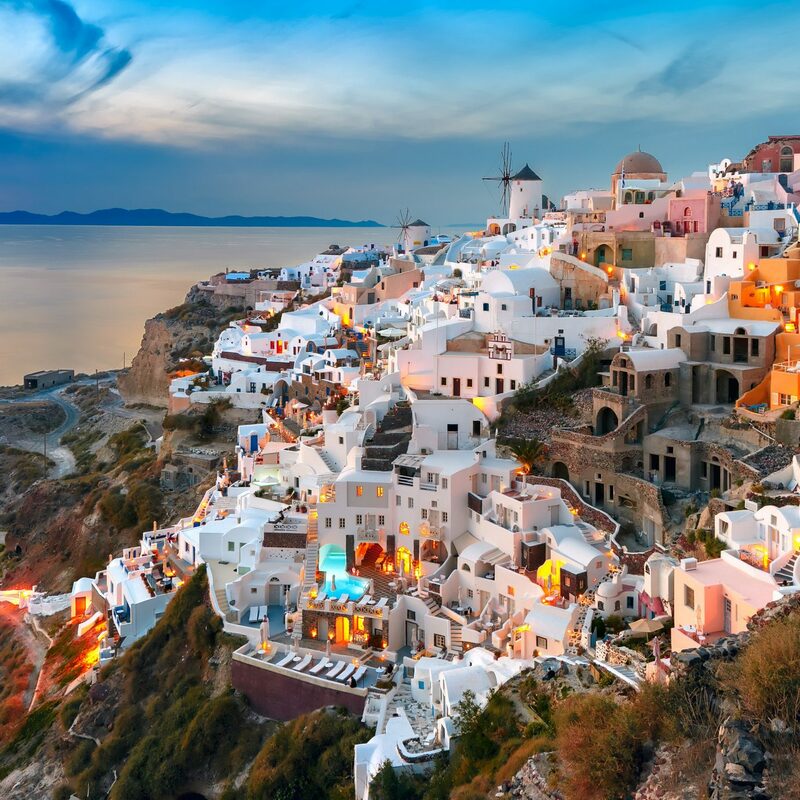 There are great restaurants as well as ice cream/ gelato spots. We had fireworks one night and it was lovely.